As you may know, I am a huge coffee lover. And because it's 5am somewhere, I pretty much deem coffee as beverage of choice 24/7. 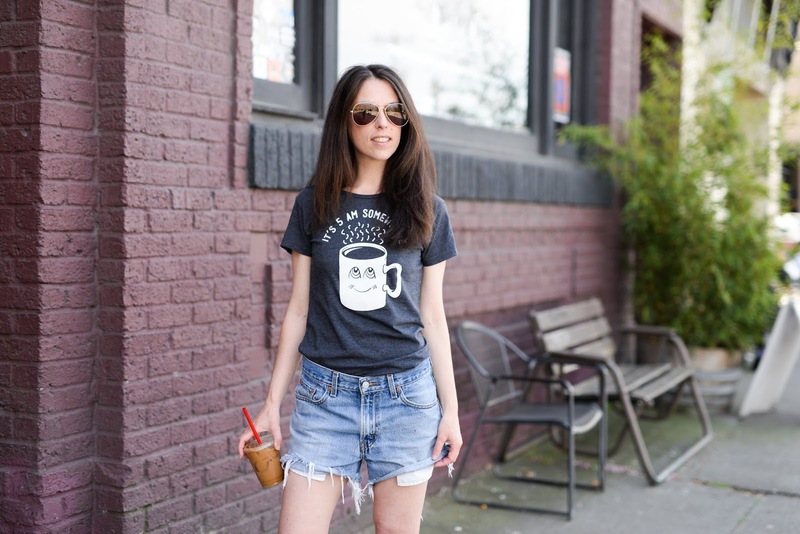 So when I saw this oh so adorable "it's 5am somewhere" tee, I knew it was a must for my closet, as well as perfect for a recent 80+ degree day in Seattle. Yes, 80 degrees on a Seattle Spring day! That is definitely a secret Seattle residents keep from the rest of the world. Oops I mean 50 degrees and raining . 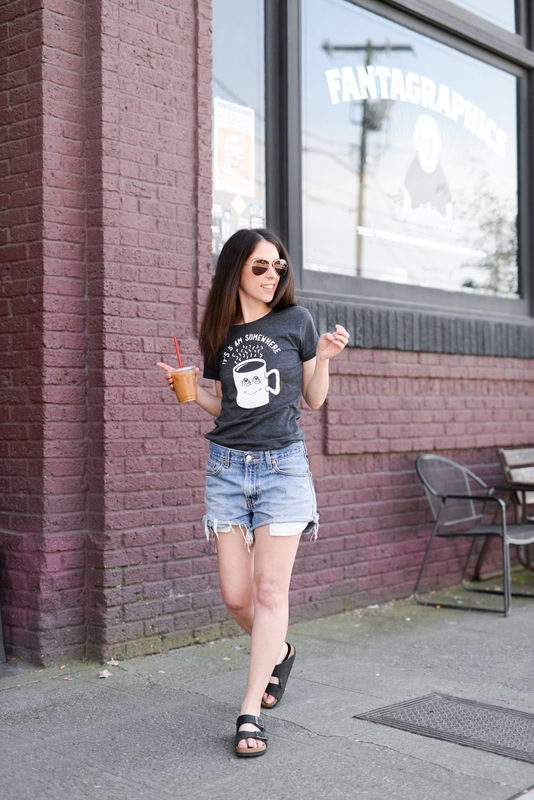 . .
For a stroll through Seattle's up and coming Georgetown neighborhood, I paired this Headline Shirts Tee with a pair of vintage Levi's cutoffs I scored at Seattle Goodwill (DIY! 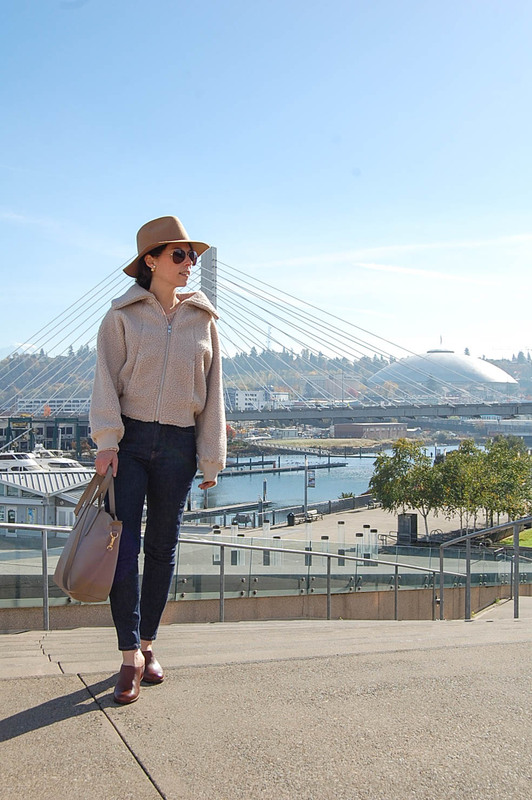 ), my favorite Arizona Birkenstock's, and a pair of Cole Haan Aviator Sunglasses I scored in my swag bag at Stylish in Seattle! Headline Shirts, where i picked up this tee, is based out of San Francisco, California. They offer intelligently funny tees with the mission to to create fun, premium apparel that leaves an impression. They live to make people laugh and have fun, but are also dead serious about their products. They design everything to fit just right with the softest, most comfortable material they can get their hands on. Headline signature tees are made from lightweight cotton and poly/cotton fabrics, and printed with eco-friendly inks. Hello favorite tees! 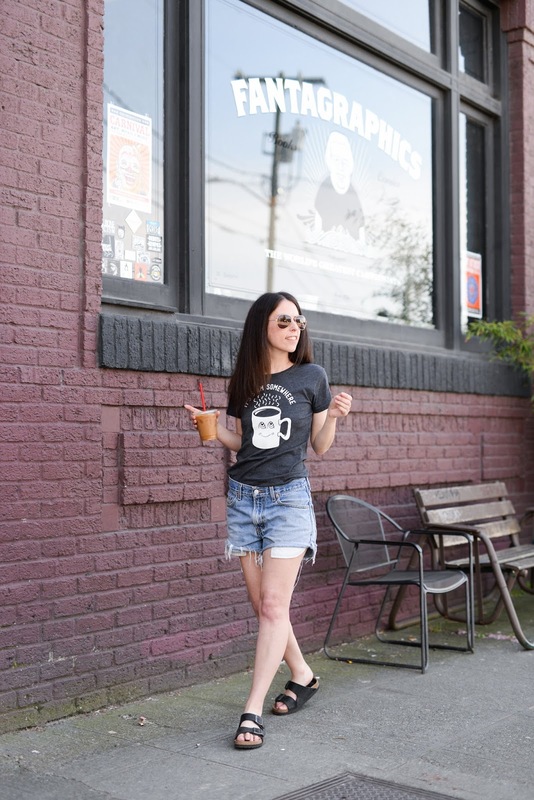 And because I was 1. in Seattle and 2. wearing this tee sharing my love for coffee, a stop at All City Coffee was an essential. I picked up an iced coffee (no sugar, small drop of cream) to go and then headed over to Georgetown Records down the block. 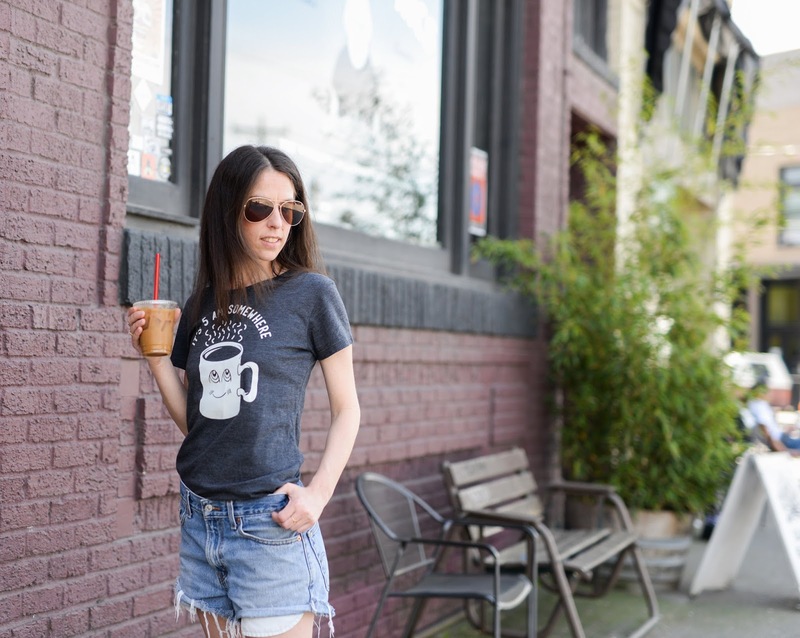 Georgetown is one of my favorite Seattle neighborhoods; lots of great restaurants (The Hangar Cafe is a must for Brunch), art galleries and home to the Georgetown Trailer Park Mall! 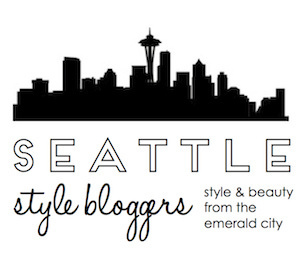 Just south of downtown Seattle and a bit under the radar, this neighborhood is definitely worth a visit. Also how great are these denim cutoffs? I was lucky enough to score a pair of vintage Levis at the Seattle Goodwill Capitol Hill neighborhood store and decided they didn't fit quite just the way I wanted as jeans. 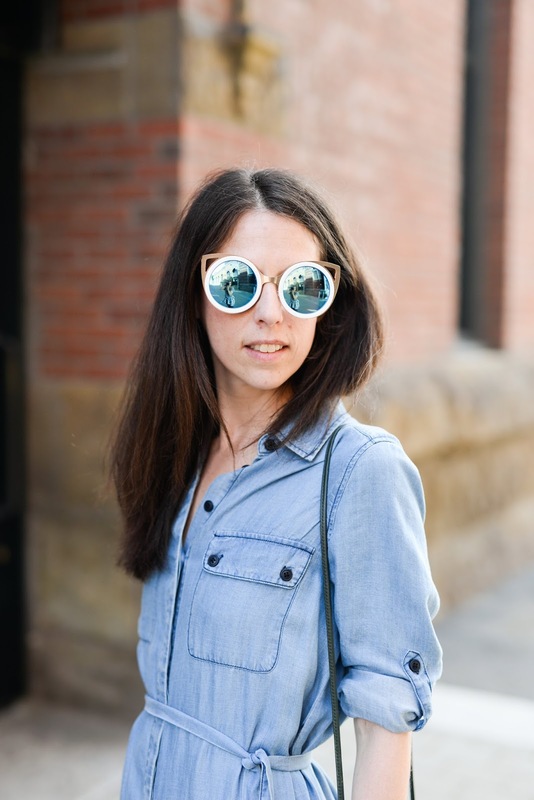 However they are just perfect as denim cutoffs! I often find the best shorts and cutoffs are ones I do myself (DIY! ), so thrifted vintage denim is just perfection! And so so happy that Summer is on the way and it's sandal season. I definitely deem Birkenstock's on trend again this summer and plan to wear mine all day and everyday. Okay so maybe I will have rotate with my Chloe, K.Jacques, and Ancient Greek Sandals because I seriously love sandals and might own quite a few pairs I love! But these Birkenstock's, so good! And because it's 5am somewhere and I am now craving a cortado after writing this post, I am off to a coffee shop for my espresso fix.